The 2030 Agenda for Sustainable Development recognizes international trade as an engine for inclusive economic growth and poverty reduction, and an important enabler to achieve the Sustainable Development Goals (SDGs). The SDG framework explicitly recognizes different trade policy measures. Trade and trade related policies have a multifaceted link to the SDGs. In addition to the trade-growth economic development nexus, trade is strongly linked to sustainable development goals such as food safety, health, climate, labour conditions, etc. Non-tariff measures (NTMs) cover measures such as sanitary and phytosanitary standards and technical barriers to trade that aim to protect human, animal and plant life as well as the environment. They are necessary instruments to achieve social and environmental objectives. However, such measures can become barriers to trade hampering economic development opportunities. Evidence indicates that NTMs can be three to four times more restrictive than tariffs and are the main contributors to trade costs. NTMs have thus moved to the forefront of the discussion on sustainable global trade patterns and are key to enhance policy coherence for sustainable development. To help developing countries better understand how NTMs are linked to the SDGs ESCAP, and ARTNeT, have conducted and facilitated research on NTMs through various past and on-going projects throughout Asia and the Pacific. In 2015 ARTNeT formalized its partnership with AFD, with whom it established a project that will contribute towards narrowing development gaps between CLMV countries and other ASEAN members. The urgency to narrow development gaps within and among ASEAN countries was also recognized by ASEAN leaders who, at the 19th ASEAN Summit held in November 2011 in Bali, Indonesia, endorsed the “ASEAN Framework for Equitable Economic Development” to facilitate the realization of the ASEAN Economic Community (AEC) Blueprint. This project aimed to contribute towards narrowing development gaps between CLMV countries and other ASEAN members through the implementation of policy-oriented research activities, research capacity development programme and knowledge-sharing initiatives. The project focused on conducting of policy-oriented research and technical training in CLMV countries to help them follow an inclusive and sustainable development process. The objective of the project was to strengthen the technical and analytical skills of officials and researchers from CLMV countries to manage the use and assessment of the impact of (1) non-tariff measures, and (2) geographic indication in the context of trade-related intellectual property rights. The intended long term impact is the development of effective responses in CLMV countries in these policy areas. The expected outcome is improved technical and analytical capability of CLMV officials in managing NTMs, including through higher readiness to share information on own non-tariff measures (NTMs) through WTO notifications and AEC Trade Repository. Likewise, better understanding of the geographic indication (GI) for promoting sub-regional employment and trade will be among the expected impacts. 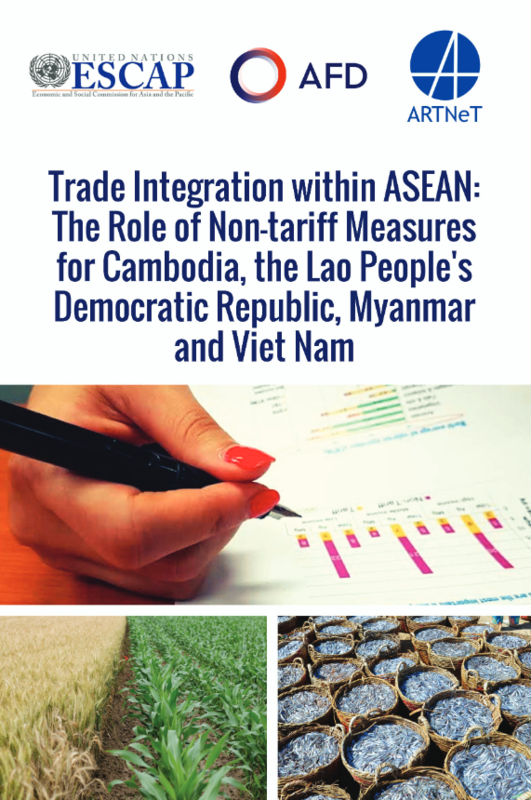 This project led directly to the publication a series of studies on Trade integration within ASEAN: The role of non-tariff measures for Cambodia, the Lao People's Democratic Republic, Myanmar and Viet Nam. Furthermore, the inputs discussed under intellectual property rights were used in finalizing the Handbook on Negotiating Development Oriented Intellectual Property provisions in Trade and Investment Agreements. Beneficiary Countries: All ESCAP members with a particular focus on Cambodia, Lao PDR, Myanmar and Viet Nam. The purpose of the project is to strengthen capacity in developing and least developed countries to measure and monitor the impact of NTMs on the progress towards the sustainable development goals. The objective is to develop a composite index (comprised of indicators) to measure impact of countries' use of NTMs in achieving economic, social and environmental development. The index will thus complement and integrate existing SDGs indicators with regard to allowing government officials to monitor their countries’ progress towards the SDGs. An expert group meeting has been held, and more information is forthcoming on future events and publications. Conventional trade theory suggest that countries physically located next to each other should trade the most with each other. Yet, trade statistics on trade flows of North and central Asia shows very different patterns. For example, in 2015, 92% of exports from Azerbaijan went to countries outside of the NCA region, with only 4% going to Georgia, 3.6% to the Russian federation, 0.5% to Uzbekistan, 0.1% to Turkmenistan and Kazakhstan, 0.02% to Tajikistan and 0.01% to Kyrgyzstan. In terms of imports, while the Russian Federation was the largest single source of imports (15.6%), 82% of imports came from non-NCA countries. This mismatch between expected trade based on geographic location and actual trade values is evident among other countries in the subregion as well. While some of reasons are due to similar production structure, similar export product baskets, and conventional barriers to trade like tariffs, an emerging concern is the increasing incidence of non-tariff measures. This project will examine the impact of NTMs on subregional trade among NCA countries. Ultimately, the goal of this project is to reduce costs of non-tariff measures among the member States in support of the 2030 Agenda for Sustainable Development through enhanced efficiency, transparency of NTM regulatory practices and mutual recognition of associated standards among the member States through enhanced knowledge and capacity of policymakers. Beneficiary Countries: Selected North and Central Asian (NCA) countries (Armenia, Azerbaijan, Georgia, Kazakhstan, Kyrgyzstan, the Russian Federation, Tajikistan, Turkmenistan, and Uzbekistan).